One of the most breathtaking sights to take in at the 29th Olympic Games is the dazzling botanical display for the Olympic Topiary Gardens of artistic garden sculptures — an exhibit depicting the beauty and value of biodiversity and ongoing efforts of 80 botanic gardens from more than 25 countries to preserve our natural plant heritage. Chinese potted landscapes, similar to the Japanese Bonsai, have been famous for centuries and often described as "soundless poetry" or "living sculpture". In a pot no larger than a wash basin, the ingenious craftsmen create a miniature reproduction of a natural scene using stunted trees and plants, rocks and sometimes water. It is difficult to determine when the Chinese first started to grow Penjing grown because in the beginning they were only a folk art. A mural in the tomb of Crown Prince Li Xian of the early Tang Dynasty shows that they had already won royal favour by then. Great Tang and Song poets like Wang Wei, Han Yu, Bai Juyi, Su Dongpo and Lu You all mentioned them. Monographs describing the miniaturizing of trees and the art of miniature rockeries began to appear in the Song Dynasty and reached their peak in the Ming and Qing dynasties. Potted landscapes require painstaking efforts to create, taking dozens to hundreds of years. Craftsmen devote all their lives to their art works only to have later generations enjoy them to the fullest. Mr Wu's 1st book, Man Lung Artistic Pot Plants, gives a detailed description of the history and development of penjing and many lovely illustrations with full explanations. A New Book "Man Lung Penjing" by Mr Wu Yee-Sun is now available and is a witness of Mr. Wu's efforts in establishing his signature style of penjing over the last seven decades. - This website has been created in order to continue the tradition of discussion and exchange among penjing experts and hobbyists, anyone interested is invited to visit the website. Aristocratic Chinese Penjing - an interesting series of articles about Penjing. 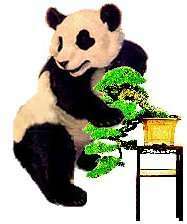 Penjing is the Chinese art of creating a miniature scenery in a container. It comprises three main categories, The first, Tree Penjing, is a form very much akin to the Japanese concept of Bonsai. The second, Landscape Penjing, rocks not trees, serve as the main artistic medium, and they are used to re-create distant views of vast mountain panoramas. The third, Water and Land Penjing, can be viewed as a synthesis of the other two forms where the artist uses trees, rocks, and water as design elements to create, in miniature, a more complete natural landscape. Dianne Miller from New Zealand has visited China several times, here are her recollections and photo's from some of the most inspirational places she has been, also some details about Bonsai Displays and Bonsai contacts in China. This is very informative and reading is a must if you are planning to visit China with lots of information about Shanghai, Nanjing, Suzhou, Yixing, Wuzhou, Yangshuo, Guilin, Huangshan, Shilin, Emeishan.